Whether you or your loved one is looking for access to high quality, 24-hour health care or simply to be freed from the responsibilities of living at home, Holdrege Memorial Homes offers our residents a warm, secure, home-like environment. Holdrege Memorial Homes is a Skilled Nursing and Assisted Living facility, and is proud to be the only facility in the area offering spacious private rooms to all residents regardless of their payer source. With amenities such as a comprehensive activities program, an in-house beauty shop, buffet dining, wireless internet access, transportation services, on-site physical therapy and wellness rooms and a spiritual ministries department, our residents have everything they need located conveniently in one place. 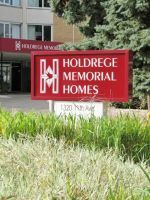 Holdrege Memorial Homes is also one of the largest employers in Holdrege area, with approximately 150 full and part-time employees and a payroll of over $3.5 million a year.